It works but the query string it generates uses the Term ID (TID) instead of using the more readable and clean term name. Make sure Specify validation criteria is checked and you should be presented with more options. Under Validator choose Taxonomy term. You can optionally select with vocabularies to allow. Under Filter value type choose Term name converted to Term ID and check the Transform dashes in URL to spaces in term name filter values checkbox. Allows url query values to be used as contextual filter arguments. This module is an answer to the many stackoverflow topics where the solution is to fetch query parameters by using the default PHP argument filter in Views (yucks!). Configure validation criteria to use term name instead term Id. The module will help you use contextual filters from query strings. The relationship allows the view to access parts of the taxonomy term other than the ID, such as its name. AFIK, you will need to alter the way exposed filters lists the terms. If you inspect, you will see term ids as values. You will need to replace them with actual term names. You can use views API to do this. There is no other quick way to achieve this. 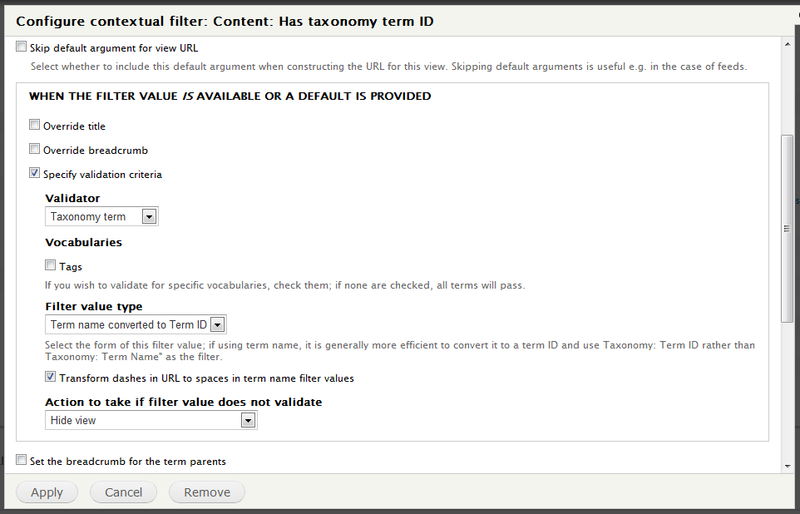 In addition to altering the term values in filter, you will also need to write the code that map the taxonomy names to term id when you perform an operation. Title in url instead of tid? How to pass the query string used to access a page in a link in a views content pane? How to change taxonomy term ID to term name?